This allows for a much more enjoyable in-car music experience as you can simply get in and drive.Connects iPhone/iPod and cars original iPod interface(USB & AUX ports)using this great kit and enjoy your music in full stereo sound.Transmit audio signals and charge your iPhone via lightning connector at the same time.This is a very cool innovation that is sure to add to your entertainment experience! Drimfly has total confidence in our products and backs them with a 12-month replacement warranty.We believe in providing quality and value, for life. Connects iPhone/iPod and cars original iPod interface(USB & AUX ports)using this great kit and enjoy your music in full stereo sound. 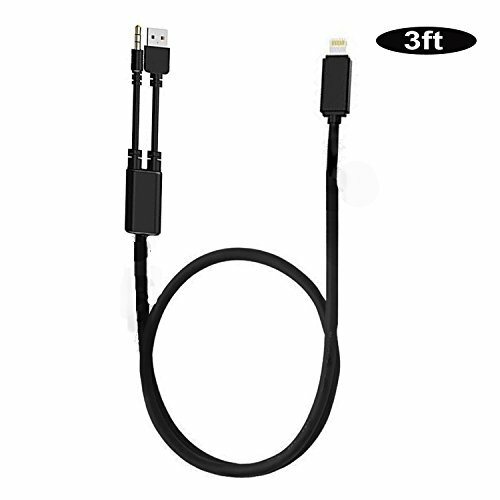 Transmit audio signals and charge your iPhone via lightning connector at the same time. Plug & Play, simply press AUX on the iDrive controller buttons.This cable transmits audio from device to car stereo only. It won't display album list, control the device. This allows for a much more enjoyable in-car music experience as you can simply get in and drive. For BMW's without an in dash navigation system/screen;Compatible with BMW E82, E87, E88, E90, E91, E92, E93, E60,E61, E70, E71 and new LCI versions, 1 Series, 2 Series, 3 Series, 5 Series, 6 Series, 7 Series X1, X3, X5, X6 and Z4 which have USB audio interface (S6FLA) and Mini Cooper R55, R56 & R57+ models. If you have any questions about this product by Drimfly, contact us by completing and submitting the form below. If you are looking for a specif part number, please include it with your message.